[BIBLE - DUTCH - KEUR]. 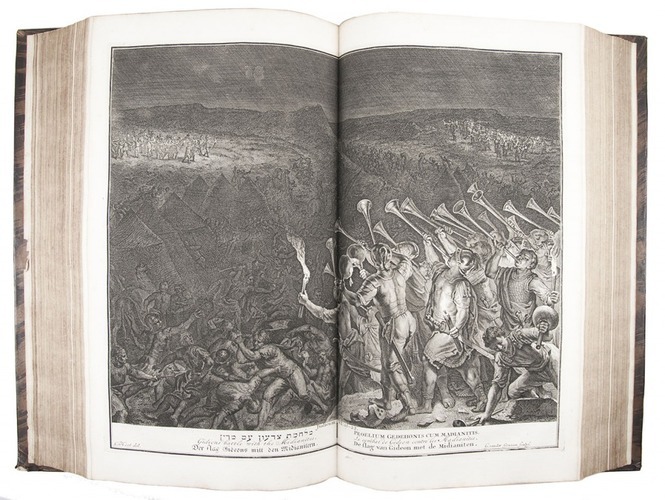 Biblia, dat is De gantsche H. Schrifture vervattende alle de canonijcke boecken des Ouden en des Nieuwen Testaments. 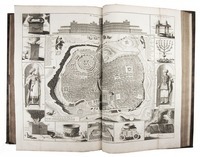 Dordrecht, Jacob and Pieter Keur; Amsterdam, Pieter Rotterdam and Pieter Rotterdam the younger (colophon: printed by Jacob and Pieter Keur, Dordrecht), 1714 (New Testament without Pieter Rotterdam the younger, 1713). 3 parts in 2 volumes. 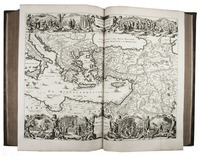 Large folio (42.5×27.5 cm). 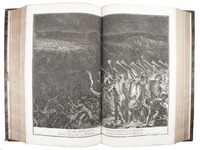 With engraved general title-page, series of 6 engraved double-page folding maps by Daniël Stoopendaal (his larger set), a complete set of 184 full-page and 28 double-page engraved illustration plates by various artists, including A. de Blois, J. van Vianen and J. Mulder, after G. Hoet, B. Picart, A. Houbraken and others. Gold-tooled sprinkled calf (1738?). 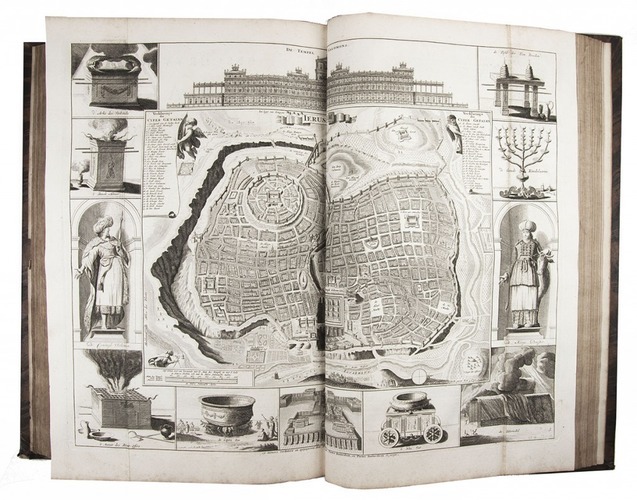 Beautifully illustrated large folio Dutch States Bible (Statenbijbel) with 6 six maps, including a world map, and a complete set of the striking illustrations drawn and engraved by Bernard Picart and others. 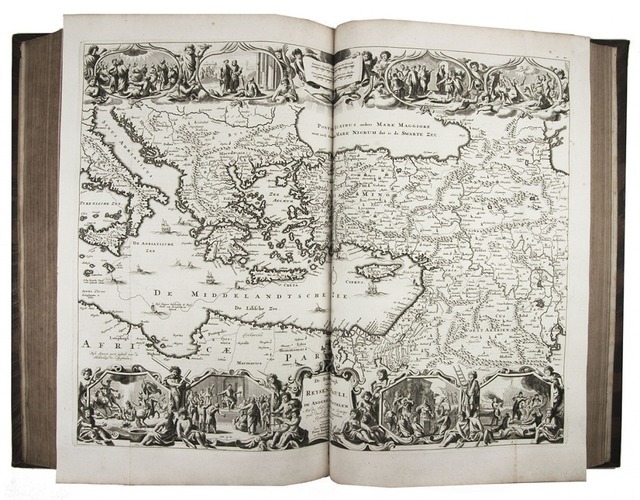 The maps belong to the larger of two series by Daniël Stoopendaal and were explicitly made for the Keur Bibles with, for example, Bible scenes (rather than figures from classical mythology) decorating the world map. With the armorial bookplate of Hendrik Gerardsz. van Couwenhoven (1711-1792) and a short handwritten genealogy of Couwenhoven's family, from Couwenhoven's marriage in 1738 to the birth of this last child in 1766. The binding appears to date from the middle quarters of the 18th century, so it may have been bound and presented for the occasion of the 1738 wedding. In very good condition. The binding is slightly worn at the joints, the headcap of volume 1 is damaged and there are a few other minor surface imperfections, but it remains generally in very good condition. Darlow & Moule 3337; for the maps: Poortman & Augusteijn, pp. 196-203; for the prints: Poortman, Bijbel en prent II, pp. 140-145.